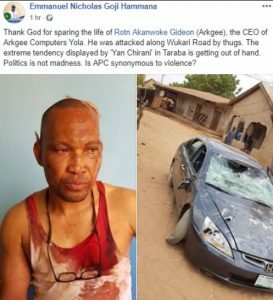 An Igbo businessman, identified as Rotn Akanwoke Gideon, aka Arkgee, the CEO of Arkgee Computers in Yola narrowly escaped death after being attacked by thugs along Wukari Road in Taraba state. Arkgee’s car was destroyed during the attack and he suffered injuries which made his white singlet turned red. 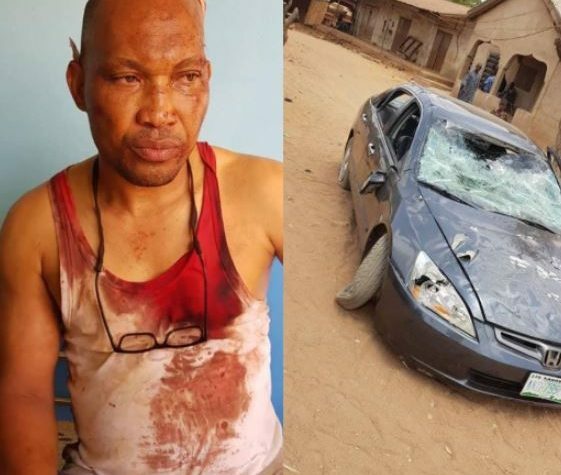 Sharing the story, Emmanuel Goji Hammana blamed the “Yan Chirani” in Taraba state for the attack.